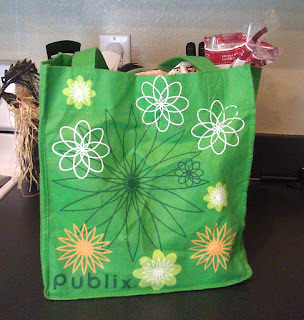 It's almost Earth Day, so here's an eco-friendly tip I learned from a friendly bagger at Publix. I had come through the line with my sad little reusable shopping bags. They were floppy and flimsy because the little plastic pieces that sit in the bottoms had broken and/or fallen out; they had been pretty neglected and we were kind of embarrassed to keep using them. If this has happened to you too, don't panic. There is a simple, free solution. Find an old cardboard box, cut a side off, measured to the dimensions of the bottom of the bag and slide it in. You'll be back to proudly carrying your groceries again in style. So easy, so earth-friendly and so economical! I've been so inspired by all the cool creations I've found on Pinterest that I decided to share some of my own ideas. I call my precious kids, Travis and Emily, my two silly monkeys because they are funny and always getting into some kind of trouble.